Abstract: Bitcoin generates net-new value from "mining" in a distributed network. 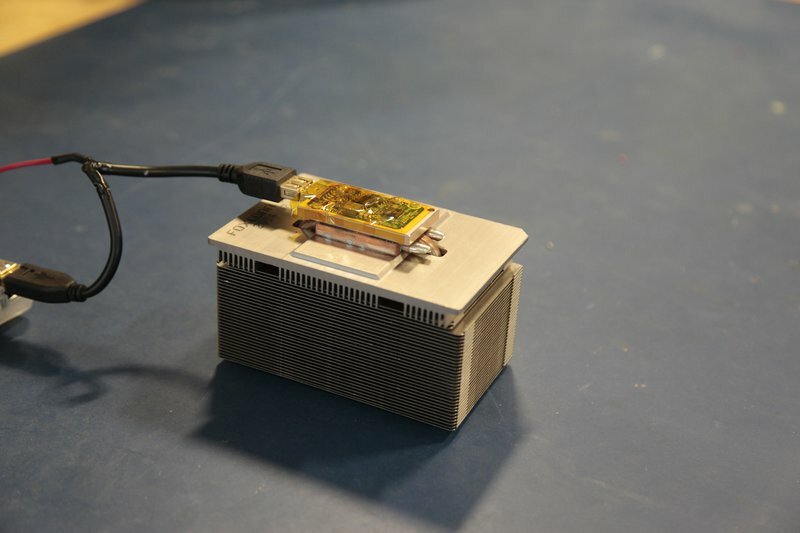 In this work, we explore solar micro-mining rigs that transform excess energy capacity from renewable energy (hard to trade) into money (fungible). Each rig runs a small Bitcoin miner and produces Bitcoin “dust” for micropayments. We envision these micro-miners populating a highly distributed network, across rooftops, billboards, and other outdoor spaces. Where systematic or environmental restrictions limit the ability to freely trade the underlying commodity, micro-mining produces new economic viability. Renewable energy-based, micropayment mining systems can broaden financial inclusion in the Bitcoin network, particularly among populations that need a currency for temporary store of value and must rely on flexible electricity off the grid (e.g., unbanked populations in the developing world). This exploration seeds a longer-term goal to enable open access to digital currency via account-free infrastructure for the public good. First, we distinguish between "Bitcoin," the full protocol, and "bitcoin," the currency. The Bitcoin cryptography protocol describes a novel, distributed system of exchanging, securing and validating transaction records of financial value. The bitcoin currency is the medium of transaction and the reward for participating in network stewardship (i.e. validating and mining others' transactions). Participation in the network is pseudonymous, with the provenance of bitcoin tracked from public key address to public key address. The "owner" of a bitcoin sum is the keeper of a public key address at which the bitcoin amount can be redeemed. For an approachable overview of the protocol and currency, read Michael Nielson's blogpost . The Bitcoin protocol is often referred to more generally as "the Blockchain," referring to the append-only ledger that chains blocks of transaction records together into an immutable log. Decentralization proves key to the "trustless" nature of the protocol, as all participating full nodes keep copies of the authoritative log (rather than trusting a central orchestrator). 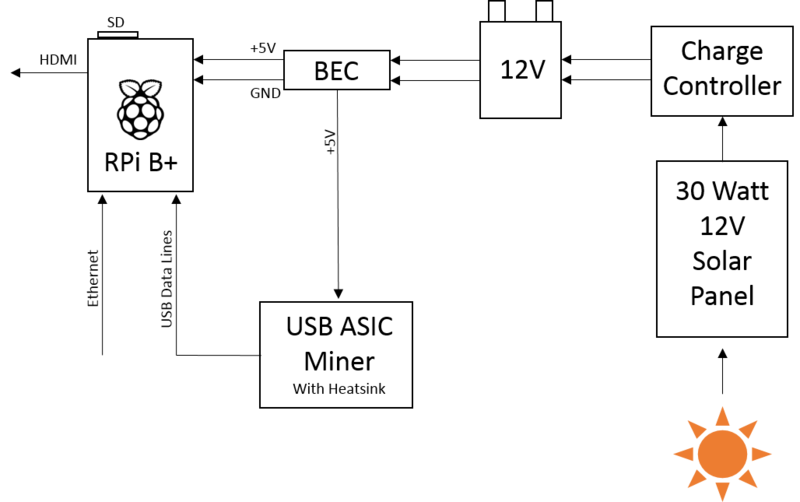 The Proof of Work algorithm used to secure the transaction record from tampering builds on this trustless model, where individual nodes must compete to solve computationally-intensive "puzzles" (hashing problems) before the next block can be appended to the chain . These worker nodes are known as "miners", and the work required of miners to append blocks ensures that it is difficult to rewrite history on the blockchain. This holds, provided that miners do not collude and attempt to direct collective mining power at modifying a block, also known as a "51% attack" . The protocol issues mining rewards in sums of bitcoin. These are earned for mining new blocks, recognizing the crucial role that miners play both in securing content and validating new transactions. This Proof of Work process essentially exchanges energy for security, as the mining process consumes extensive computational power. The bitcoin currency has suffered from significant volatility in the years since its initial release (see Market Price fluctuation) . Without government backing or a coordinated monetary policy, the currency lacks stability. What it lacks in stability, it gains in independence and flexibility— its proponents often value the libertarian principles of unregulated money that can be spent across borders, without government interference and exorbitant banking fees. It remains to be seen whether Bitcoin-proper can function as a dependable, general purpose currency system for a broad audience. As a new mechanism for flexible micropayments however, bitcoin shows much promise . A robust, secure system of bitcoin "dust" payments could enable monetization of data sharing, fine-grained metering for content exchange (pay per-view), ease of payment for minor, recurring services (like Amazon Mechanical Turk) and more. As Bitcoin companies explore tech development for micropayment channels (and grapple with the important consequences for the protocol's security model), we note an opportunity for low-energy, background processes that "dust-mine." 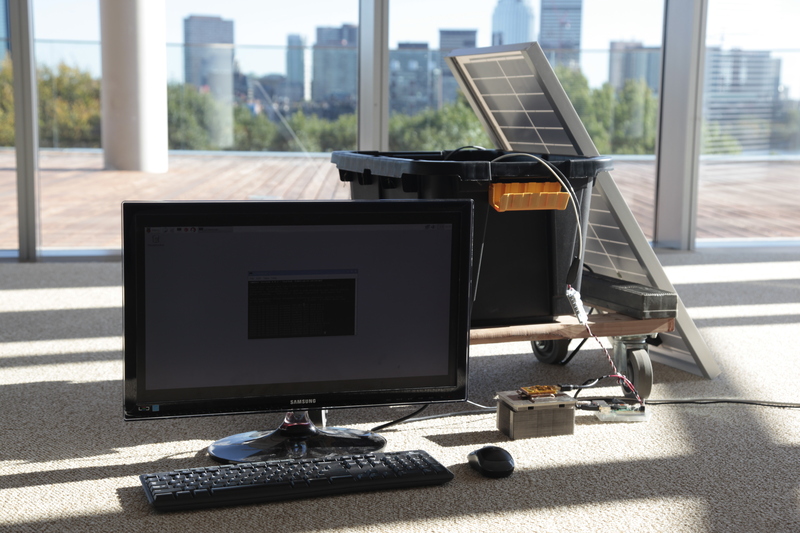 Solar Micro-Mining delivers a renewable energy mining model, where users can deploy a low-cost, modular addition to their existing solar grids as a supplemental source of bitcoin dust for their micropayment needs. We envision these micro-miners populating a highly distributed network, across rooftops, billboards and other outdoor spaces where they can transform excess energy capacity into a fungible token of exchange. In early 2015, The Economist estimated that bitcoin mining consumes over 1.46 terawatt-hours per year (enough energy to run about 135,000 American households) . The network's collective mining power, or hash rate, has more than quadrupled since then , consuming even more electricity. With the high cost of "minting," does bitcoin make sense as a currency? When comparing this cost with favored currencies of the past, particularly Gold and fiduciary currency (or "Fiat" currency), a curious grid emerges. We see that gold requires high investment to produce, i.e. the cost of physically mining it from the ground, but also carries high intrinsic value. On the other end of the spectrum, paper currency is cheap to produce, but carries little intrinsic value. As we show below, bitcoin slices through this grid inauspiciously, with a high cost to produce (hard computational processes requiring extensive electricity) and zero intrinsic value. We thus return to the question— does bitcoin make sense as a currency? We look to address this problem of mining energy inefficiency by harnessing latent, unused capacity from an already distributed network of renewable energy rigs. To test the idea's feasibility, we have built the proof of concept prototype discussed below. To keep costs down and keep the assembly process realistic for resource-challenged environments, we intentionally did not choose best-in-class hardware. We scrounged for parts, reused old lawnmower batteries, and bought one of the least expensive ASIC Miners on the market. With inherent limitations and inefficiencies in the hardware, we then tweaked the software to optimize the system, in the belief that custom software configurations are more easily replicated, shared and implemented than expensive, custom hardware. We capture energy from the sun via a 30 watt solar panel, in line with a charge controller to prevent the batteries from overcharging. 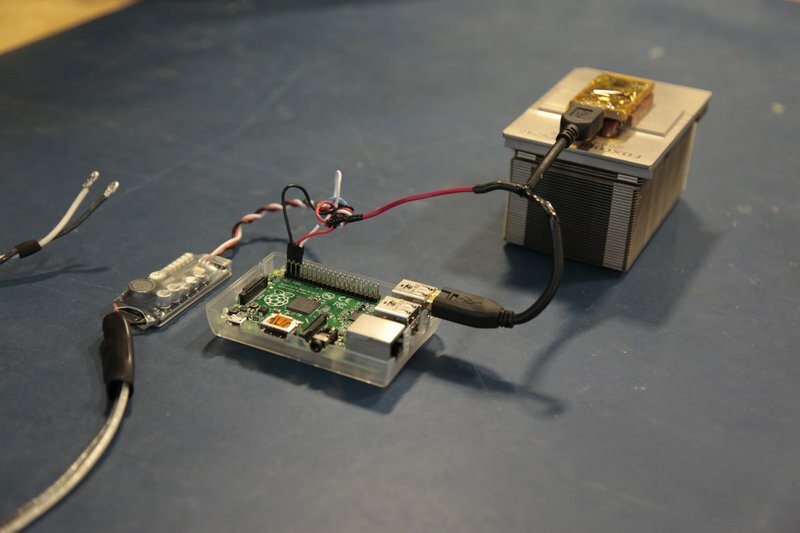 The 12V output from five batteries (wired in parallel to increase capacity) flows to a BEC, where we step down the output from 12V to 5V for the Raspberry Pi's receiving requirements. 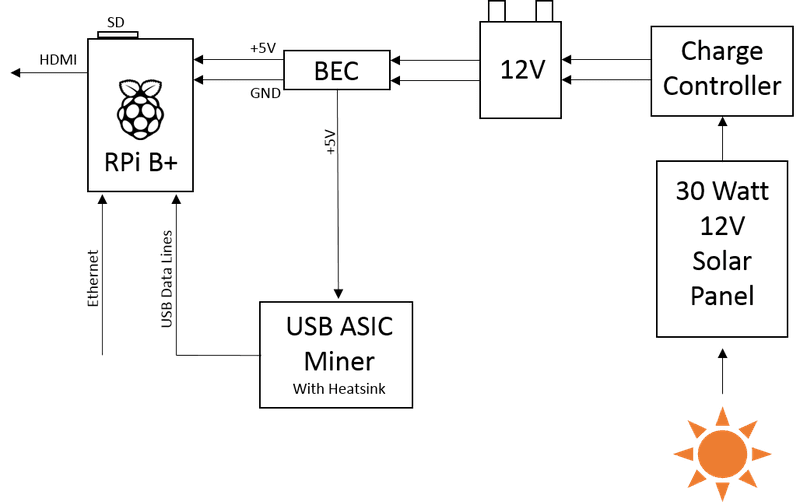 In parallel, we lead a 5V line from the BEC to power the ASIC Miner directly. USB data lines connect the output of the ASIC Miner back to the Raspberry Pi's processor. We obtain connection to the Bitcoin network via an ethernet line, but this can also be achieved with a standard WiFi dongle. For monitoring purposes, we attach a screen via the HDMI output of the Pi. The removable SD card allows multiple software configurations to be easily exchanged if desired. We envision this mining rig running as a background process during other more critical solar panel uses, or during non-peak hours. Bitcoin mining alone (at the individual, hobbyist scale) is unlikely to warrant new investment in solar panel technology, as the upfront costs for such deployments can be quite high. Our full system setup comes to around $220 in equipment, primarily dominated by the startup costs for a panel and batteries. Reusing existing solar implementations and capturing excess capacity proves compelling for the bitcoin micropayment use case, as we discuss in more detail below. When running the mining software at full processing power, the system draws ~11.5 watts (max 3 watts for the Pi, estimated 6 watts for the miner, 2.5 watts for other peripherals). When working with a 30 watt panel during sunlight-only use, this gives us ample buffer for the well known problem of solar panel efficiency loss. To be able to run the rig overnight, we would need: 11.5 watts * 24 hours = 276 watt-hours. Assuming we receive 8 hours per day of sunlight, our rig would produce only 30 watts * 8 hours = 240 watt-hours. As this is already insufficient for always-on operation, before considering efficiency losses and energy storage limitations, we intend to work on a second stage project with at least a 60 watt panel (480 watt-hours from 8 hours charging). We will also adjust our battery capacity as needed. Hardware wiring downstream of the batteries: power, stepped down via BEC, feeds the RPi and ASIC Miner separately, with data lines from ASIC Miner leading back to the RPi. We affixed the heatsink to the back, flat platform of the ASIC miner to optimize its hashrate. The ASIC miner is designed to dynamically adjust, facilitating additional hashing computations when kept below certain temperature thresholds. Though the hardware documentation lists an upper maximum of 3.6 Gh/s (Gigahash per second) , we were able to regularly achieve upwards of 4.7 Gh/s with the heatsink modification (30% improvement). Close-up of the ASIC miner, mounted to heat sink. CG Miner is a standard mining software for Linux, Windows and OSX systems, designed and distributed by Con Kolivas . This distribution supports the stratum mining protocol and most all of the commonly used Bitcoin hardware ASICs. By setting custom values for two of the Icarus parameters in our mining command ("--icarus-timing" and "--icarus-options"), we were able to force a higher hashrate. While this would usually cause the ASIC to overheat and reduce performance, the heatsink properly alleviated temperature rise and enabled continued use of the ASIC at the higher 4+ Gh/s rate. We added a script in the Pi startup files to automatically configure these mining parameters, in order to jump start mining as soon as the rig is turned on (supports remote operation for rooftops or other inaccessible areas). The mining hardware described above, when supplied with full power over 24 hours, produces ~30,000 satoshis a day at Bitcoin's November 2015 network size. Notably, as the Bitcoin mining network grows in collective hashing power, the expected yield will drop as the contribution of 4+ Gh/s becomes a smaller piece of the pie. Miners manage this trend by buying incrementally better hardware to keep up with the hashrate, or by switching to more profitable pools. Ongoing research on Bitcoin protocol modifications may suggest ways to alleviate the mining hardware arms-race, which would further our goal of keeping entry-level mining approachable and relevant. Though 30,000 satoshis a day (or $0.13 a day at time of writing) is a modest sum, this could amply maintain a micropayment system— an attractive new model for blockchain applications where each transaction exchanges "dust" levels of bitcoin to facilitate handling more meaningful record data in smart contracts. New proposals for off-chain settlement channels, like the Lightning Network , put micropayments to use at the scale of .00000001 bitcoin, or mere thousandths of a cent. This enables a fine-grained value exchange not currently supported by traditional financial systems. Our mining system is designed to run in the background of other more critical solar panel uses, while unobtrusively generating ample bitcoin dust for these flexible micropayments. Solar Micro-Mining thus serves as a greener mining alternative for a large host of micropayment-enabled blockchain applications, from digital content payments, to royalties, to Internet of Things data registries and more. Future revisions of this system will improve usability (ease of hardware integration, simplified software), employ alternative mining algorithms (21 Bitcoin Computer and others) and deploy additional prototypes in a distributed network. We note the broader problems of Internet network access and account-free participation as worthy barriers to overcome, and look forward to designing mining architecture that will enable open-access to a greener, more sustainable blockchain. 51% Attack, Majority Hash Rate Attack. bitcoin.org. Bitcoin: A Peer-to-Peer Electronic Cash System. White Paper. How the Bitcoin Protocol Actually Works. Blog: Data Driven Intelligence. The Bitcoin Lightning Network: Scalable Off-chain Instant Payments. White paper. The Magic of Mining. The Economist. January 2015. The Promise of Bitcoin Micropayments: Corporations, Incentives and Altcoins. Russell Castagnaro: Has this continued on? It still seems viable with newer hardware. Andrew Lippman: enables, not just builds on, no?